This past week Myriad Genetic Laboratories had the opportunity to present 2 posters at the Society for Urologic Oncologists that was held in Bethesda, MD. 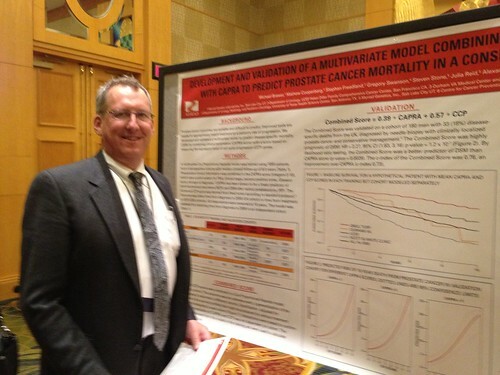 The first poster, DEVELOPMENT AND VALIDATION OF A MULTIVARIATE MODEL COMBINING CELL CYCLE PROGRESSION SCORE WITH CAPRA TO PREDICT PROSTATE CANCER MORTALITY IN A CONSERVATIVELY MANAGED COHORT was presented by Dr. Michael Brawer, Medical Director of MGL Urology Division. The data supported the validation of the Prolaris® test for use after biopsy and before definitive treatment. The Prolaris Score provides prognostic information beyond clinical variables alone, and can be used to differentiate aggressive from indolent cancer at diagnosis. The Prolaris Combined Score was a better predictor of outcome than CAPRA alone. (above) Dr. Michael Brawer, VP of Clinical Affairs for Myriad Genetic Laboratories presenting his poster at the Society for Urologic Oncologists in Bethesda, MD. The second poster, PROGNOSTIC UTILITY OF CCP SCORE IN MEN WITH PROSTATE CANCER AFTER PRIMARY EBRT, was presented by Dr. Stephen Freedland from the Duke University School of Medicine. This poster presented the data from a trial conducted in collaboration with Duke University and the Durham VA. The study was designed to evaluate the ability of Prolaris to risk stratify patients for failure after receiving external beam radiation therapy (EBRT). The Prolaris Score was significantly associated with outcome after EBRT, and provided prognostic information beyond what was available from clinical parameters. If validated in a larger cohort, the Prolaris Score could be used to select high-risk men undergoing EBRT who may need combination therapy for their clinically localized prostate cancer.